NCC Urban has inherited its experience and expertise from NCC Limited. Known for its excellence in the execution of Turn key projects, Industrial Buildings, Multistoried,Commercial structures,Townships, Roads, Bridges, Pipelines etc. and rated as growing Infrastructure Company in India with annual turn over nearly Rs. 8,200 crores. At NCC Urban Mayfair lies an experience that touches the core of your heart. 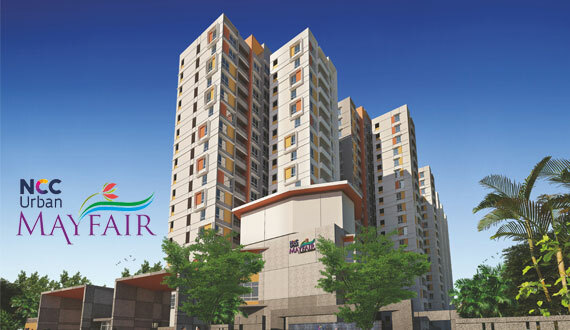 With astonishing 2, 2.5 & 3 BHK Apartments, we welcome you to a world of luxury that is a class apart.. The 58 ultra luxury 4 BHK villas Spread across a lush 9.5 acres, with every amenity and luxury at your disposal, this would make an ideal retreat for each day. NCC Urban Gardenia is an ultra-premium residential community set on 4-acres of lushness across two elegantly planned blocks, each with two high rises. Home to top-notch exclusive 4 BHK Spacious Apartments and 5 BHK duplex apartments, the community nestles 184 neighborhoods in all. National Games Housing Complex For a team sports called 'Family'. I have heard of NCC Urban since many years and I bought a flat ( Nagarjuna Meadows ) from them after being recommended by others. I was very impressed with the quality of everything, especially the fittings, and the finishing is superb. So what I have heard matched with my real experience. Our experience with NCC Urban is wonderful. They are very professional and transparent in their dealings. Their team is very dedicated and we feel that our investment is very secure. Nagarjuna Maple Heights is located at an ideal location and positive aspect is it's centrally located and in less than a year's time the flats are given to us and we are very happy about the construction and the prompt delivery. I was on the lookout for a apartment when a friend recommended NCC Urban to me. Within two days of seeing the house I was able to close the deal. Everyone was surprised. Whatever he promises he delivers. The quality of the flats is excellent. I would give NCC Urban a rating of 9 out of 10 as they are almost perfect.